The sunlight filtered through the clouds and cast a dim grayness on the city, matching Azariah's mood. The muscles across his back knotted As he strode into the meeting hall of the Sanhedrin, the highest religious authority in the Jewish nation. He took his customary seat on one of the tiers that circled the room. The messenger had spoken correctly when he had called it an emergency meeting. And he had delivered the message peremptorily, devoid of the usual courtesies offered to even a minor member of the Sanhedrin like Azariah. It indicated that the Council would discuss Jesus of Nazareth, whose words had split the group for months. The Pharisees, avowed enemies of the Teacher, had attempted to secure His death by a vote of the Sanhedrin but had failed. The Sadducees among the council, though definitely nor supportive of Jesus, had nevertheless blocked this move. They did not feel as threatened by the Man's ministry as the Pharisees did, and they secretly enjoyed the embarrassment Jesus caused their rivals. Notable leaders even among the ranks of the Pharisees had openly suggested moderation and caution in dealing with the Man, further thwarting the plans of the majority. But all that had changed since one afternoon in Bethany, a town not for from Jerusalem. Jesus had apparently restored a man, dead for four days, to vigorous life. Rumors of previous miracles had spread across the land, but the explanations offered by the authorities easily countered the reports. This miracle, however; they could not discount. It had happened in broad daylight before dozens of witnesses to a man certified dead by a competent physician in the village. No other explanation fit. Jesus had raised a dead man to life. Azariah, a Sadducee, knew this would prove mortifying. Sadducees, being religious realists, denied the possibility of resurrection. The Pharisees would never let them forget that, would never miss on opportunity to gloat over their discomfort. He also knew that the miracle would weaken the Sadducees' hold on the people. Many would now call their authority into question. The people would wonder what other mistaken beliefs the Sadducees held. Their influence in the Sanhedrin, delicately balanced against the powerful Pharisee faction, would suffer as well. Clearly now the Sadducees and Pharisees would join together and order Jesus' death to prevent any further loss of influence. And that was just problem, Azariah thought gloomily, because he still opposed such a decision. Certainly Azariah did not consider himself fool enough to believe everything he heard about the Man, but the news of the resurrection had shaken him. The evidence seemed indisputable. Secretly Azariah had sided with the small but determined group of men who counseled caution in dealing with Jesus. Although he had never spoken out publicly for either side, As Nicodemus had done, he had cast his vote consistently against execution. The Council had split as a result of the secret balloting, unable to take action. Nicodemus and his public allies had been isolated and shunned by their Pharisee associates as a consequence of their open opposition. The level of noise in the hall increased while other members of the Sanhedrin took their places. Azariah temporarily abandoned his reverie to concentrate on what was happening. He listened to the subdued voices and noted the grim focus of his colleagues. Privately he had already decided to continue voting with Nicodemus and his supporters if they opposed execution. It never occurred to him that Nicodemus might not vote in that manner. When Caiaphas, the high priest, had entered and taken his seat, Azariah realized that something was very wrong. Temple guards closed the doors to the hall to prevent any interruptions and to insure privacy. Glancing around the room, Azariah saw certain empty places among the crowd of leaders. Nicodemus, Joseph of Arimathea, and others who had publicly opposed the edict of execution had not shown up. Azariah felt his face flush with panic. He looked at Caiaphas carefully. Now he understood why the man seemed so confident and at ease in this crisis. He had eliminated the opposition! It didn't matter how Caiaphas had managed to alert every member without Nicodemus' finding out, but he had succeeded. Caiaphas' bold political maneuver guaranteed the execution mandate--if no one else challenged it openly. Azariah doubted that anyone would even try. He knew the consequences of such on action. Azariah attempted to compose himself as the meeting began, but he could not calm the pounding of his heart. The blood almost sang in his ears. The speaker of the hall stood and addressed the body, offering a prayer for guidance, but Azariah had difficulty listening. It was all a formality, a charade! Caiaphas had engineered the entire meeting. Surely everyone could see that. Someone must challenge the mandate, Azariah thought. Then an equally disquieting idea struck home. Maybe he should speak up. Instantly he amassed a number of reasons for not speaking his convictions. He was only a minor member of the Sanhedrin, after all. No one would listen to him. The majority of the council wanted Jesus dead. He would commit political suicide if he opposed that majority, whatever the reason. They would isolate him just as they had the others. He would lose the connections he'd worked so hard to establish. Perhaps he might even lose his position. One did not casually challenge a man like Caiaphas and expect to walk away unscathed. Could his family bear the shame of isolation? Would his various investments adequately support them if he lost the prestige and income that come from membership in the Sanhedrin? How could he know until it happened? Azariah forced himself out of his mental spiral and tried to pay attention to the meeting. The speaker had finished, and various members now spoke to the issue. Azariah noticed a studied preparedness about most of the speakers, As if they were "plants" following firm "requests" from Caiaphas. He marveled at the extent to which the high priest had involved himself in the proceedings. "This Teacher from Nazareth," on elderly Pharisee began, "has constantly flaunted His disregard for tradition. He openly defies the ceremonies that our ancestors instituted. Even the traditions of masses do not concern Him. Furthermore, He encourages the people to act as He does. Jesus of Nazareth menaces the very thing that binds us together as a nation and ensures our heritage: tradition!" "Our brother speaks the truth," another man affirmed. "By ignoring the traditions imposed upon the populace in accordance with the command of God, Jesus circumvents our authority, drawing our power to Himself. He has bypassed the priesthood and the leadership of the Jewish notion." Warming to the attack, a Sadducee stood to speak. "Jesus has had the temerity to challenge accepted theologies on His own authority. While it is true that we disagree among ourselves on various matters, at least we have the support from respected rabbis throughout our history for the beliefs we advocate. He cites no one, claiming His authority comes from God. Such assertions threaten the structure of our nation, our laws, and come perilously close to blasphemy!" "May I remind the assembly," a scribe spoke out angrily, "that this rebel has lied and cast evil aspersions on loyal priests and teachers. He has caused them enormous public humiliation and destroyed their effectiveness, perhaps forever." Azariah turned his attention away from the harangues only to discover that a debate raged in his own mind. "Jesus and His teachings," he pondered, "threaten the existence of Levitical authority. His removal would be a good thing for the Sanhedrin. But if He is correct and we are wrong, then it would be good to support or at least to allow Him to continue his ministry. So many things to consider! The good of the nation, the good of the Sanhedrin, the good of this Man Jesus. Which do I choose? Which is right?" "The Council recognizes Azariah; son of Zechariah!" Azariah had stood to his feet before the Sanhedrin, hoping that he wouldn't tremble. He felt as though he stood upon a barren, windswept hill, exposed to a fierce storm. For a few seconds he silently gathered his wits, and as the members turned to hear him he began to speak. "Brothers of the Council, I have listened to the many grievances we of the Sanhedrin hold against Jesus of Nazareth. But I have grown uneasy because of the many things we have not mentioned." A ripple of shocked surprise passed through the hall. Caiaphas' face turned to stone, his eyes glinting like ice crystals. Azariah plunged on. "First where are our brothers Nicodemus, Joseph, and their supporters? Should we make on important decision like this in the absence of such wise men who hove spoken good counsel in the past? Second, has Jesus been allowed to appear before us? Will we condemn Him, denying His right as a son of the law to speak in His own defense? Further, has He committed any offense that will convince the Romans that He deserves execution? Remember that we alone may not condemn a man to death without the agreement of the procurator, Pontius Pilate. In addition to all this, no one has even mentioned the miracle of Bethany. After such an event, Jesus' death might well incite on uprising among His followers, especially if they could trace His death to us. The Romans would have to restore order by force and eliminate the Sanhedrin as the cause of all the trouble." "Brothers, what if we are in error and Jesus is the Messiah? Could such a thing be possible? I know--"
"You know nothing at all!" shouted Caiaphas as he stalked out to the center of the hall, facing Azariah with a withering glare. 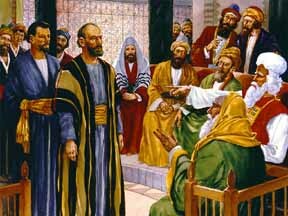 Azariah stopped instantly out of deference to the high priest, but he did not sit down. He refused to yield the floor to Caiaphas. The high priest paid no attention, and even some of the Pharisees gaped, aghast at Caiaphas' discourtesy. "This false Teacher draws the people from us. He lessens our authority, our ability to function. As a nation's leaders lose power, the nation fades into insignificant servitude. You fear insurrection, do you?" he asked with a sneer. "His followers are likely to do that anyway now that it is rumored He can bring the dead back to life. They have nothing to lose! But we will lose everything." Azariah's stomach churned. Caiaphas had diverted the Council's attention once more. Some nodded their heads. Others leaned forward. A few even voiced their agreement. Like a master musician, Caiaphas played upon their fears and their pride. "You don't seem to realize that it is better for you that one man die for the people than that the whole nation perish!" he concluded, greeted by thunderous approval. Abruptly Caiaphas spun on his heel and walked back to his place. Azariah did not have to be told he had been dismissed, defeated, his arguments ignored. Throughout the high priest's tirade he had remained standing--stunned--in mute opposition. Miserably, he sat down. The Sanhedrin, voting openly to a call of the roll, passed the execution edict minutes later. Azariah had abstained, a last gesture to signify that, in his opinion, the matter needed more scrutiny. It didn't make any difference. As he walked from the meeting hall, the other members avoided him. The isolation had begun. Azariah felt again as though he stood alone on a windy hill facing the elements. But the wind in his face smelled clean, and he could see a long way.